We care about providing you with the best support possible. Below you will find our most frequently asked questions as well as advice to help you quickly get started with the Garden Planner. You are very welcome to send us an email via our contact form if you can't find an answer to your question below. We aim to respond within 24 hours. Will the Garden Planner work for my location? * Australia and South Africa use a bespoke postcode-based system due to the huge variety of climates. Other locations may be added in the future. If your country is not in the above list, you will need to manually set your expected last and first frost dates. 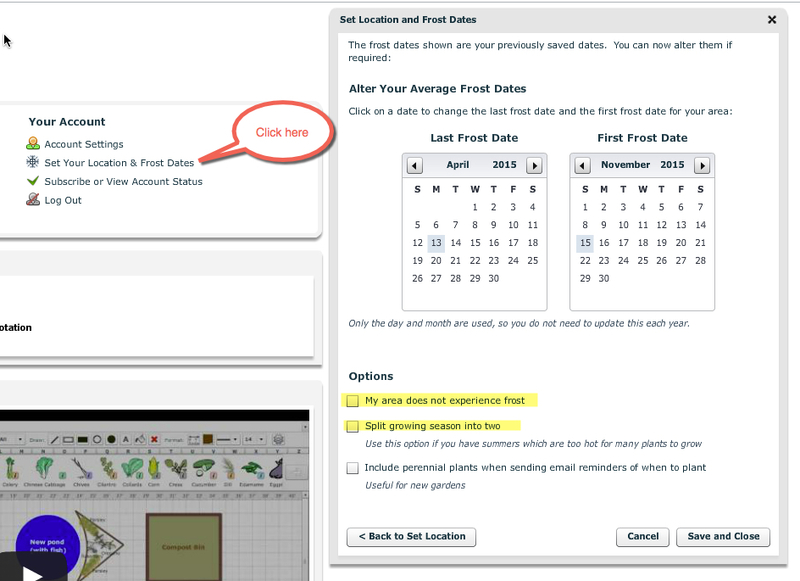 Setting your frost dates is necessary in order for the system to calculate recommended planting times and planting reminders for your area which are used on the Plant List and planting reminder emails. If you do not experience frost in your area, you can select the My area does not experience frost box. If your climate is too hot to grow certain plants during the summer, select the Split growing season into two box. This splits the season into separate spring and fall plantings for 'cool-season' plants that need it because they do not grow well through hot summers (lettuce for example). This option will be automatically checked if you have a long growing season, although you can override the setting. Will the Garden Planner work on my computer? Will the Garden Planner work on my tablet/phone? At present, the Garden Planner runs on Adobe Flash Player and therefore must be used on a desktop or laptop computer, as Flash Player is not supported on mobile devices. We have a planner specifically for iPad and iPhone, called Garden Plan Pro. It is based on and can be synced with the Garden Planner. For more information click here. We don't currently have an Android version, but it is something we hope to develop in the near future. 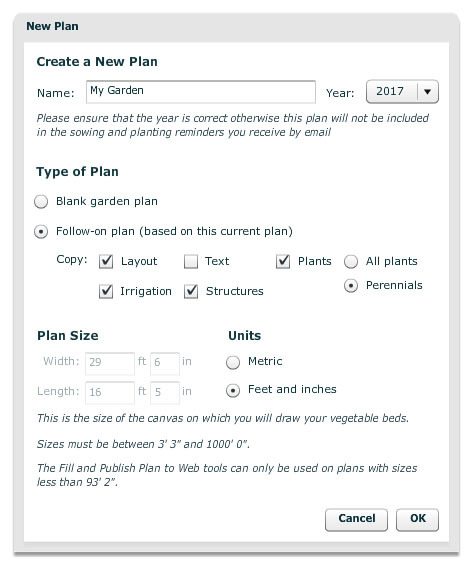 For now, you can use the online Garden Planner on a PC and then use the Publish Plan to Web feature which creates a copy of your plan and Plant List on our servers. This can be viewed from any internet-connected mobile device, although it can't be changed from there. The second half of the video 'Printing and Sharing Your Plan' on the Garden Planner dashboard demonstrates this. How much does the Garden Planner cost? To login, please visit the Login page. Enter your email address and password in the Log In boxes. If you're still unable to login, please send us an email via our contact form for further assistance. If you forget your password, click on Forgotten Password? below the Login boxes, then enter your email address to have a temporary password sent to you by email. You should only use this option if you are happy that your email account is secure and private. If you no longer have access to the email you used to set up your Garden Planner account, please send us an email via our contact form for further assistance. If you did not receive your activation code, please first check your junk and spam folders (occasionally activation emails end up in these folders). If you still can't find your activation email, please contact us and include the email address you created your account with. Visit the Account Settings page. To change your email address, enter and retype it in the boxes provided. Click Save when you are finished making your changes. When you click Save you will be sent a new activation code, which you will be prompted to enter to verify that the email address is a valid one. Visit the Set Location page. Select your country, enter your postal/zip code or address and click Search. The system will locate your garden on the map. You can repeat this with additional address details if it does not find an accurate enough location the first time. If necessary, drag the map pin to make your location more accurate. The Garden Planner will look up your nearest weather station from our database of over 5,000 weather stations. The system will set your frost dates to match averages for your nearest weather station, and these dates will be used to calculate the recommended planting and harvesting times for all the plants in our database so that they are correct for your location. You must have the correct country set for your account for this to work. Visit the Account Settings page. To change your password, enter and retype it in the boxes provided. Click Save when you are finished making your changes. How do I use the Garden Planner? 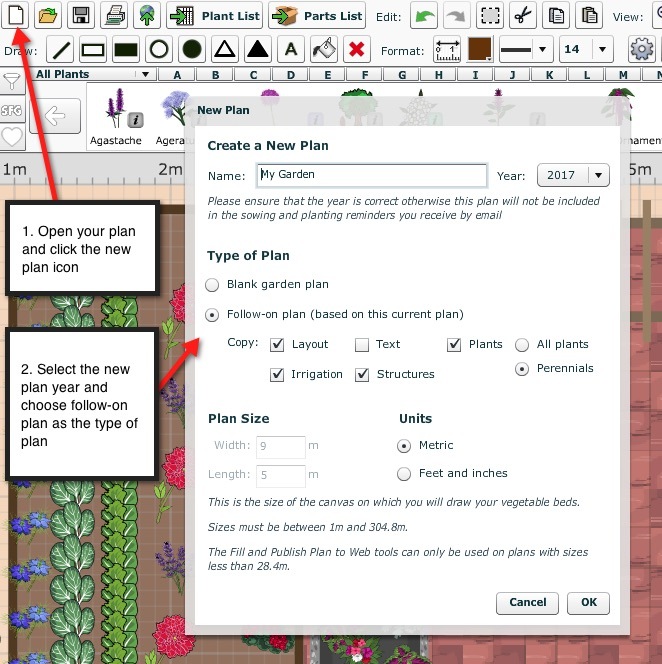 These short tutorial videos will help you to quickly learn to use the Garden Planner. NOTE: Tutorial videos may not play smoothly on dial-up and other slow internet connections. How do I change the size of my plan? You can change the size of an existing plan by clicking on the Plan Size & Grid button (the ruler icon) in your plan's toolbar and typing your new dimensions in the boxes provided. 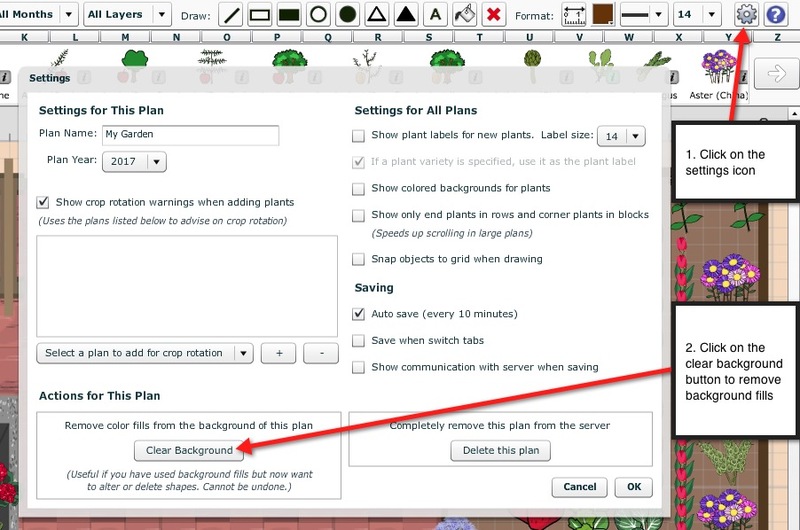 The extra space will be added to/removed from the right hand side and bottom of your plan, so if you need to move all plants and objects to the correct location in your resized plan you can move them all at once by selecting "Move All Objects on Plan". Type in the distance you wish to move all items on your plan horizontally left or right, or vertically up or down. How do I add a plant or variety not shown on your list? Click Save, then click Done, and Done. 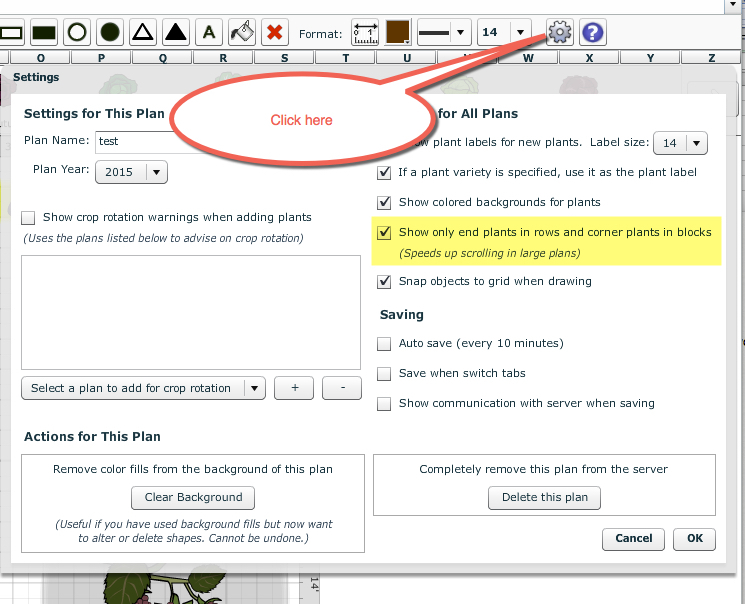 Your plant icon will now be named and will be listed separately on the Plant List. 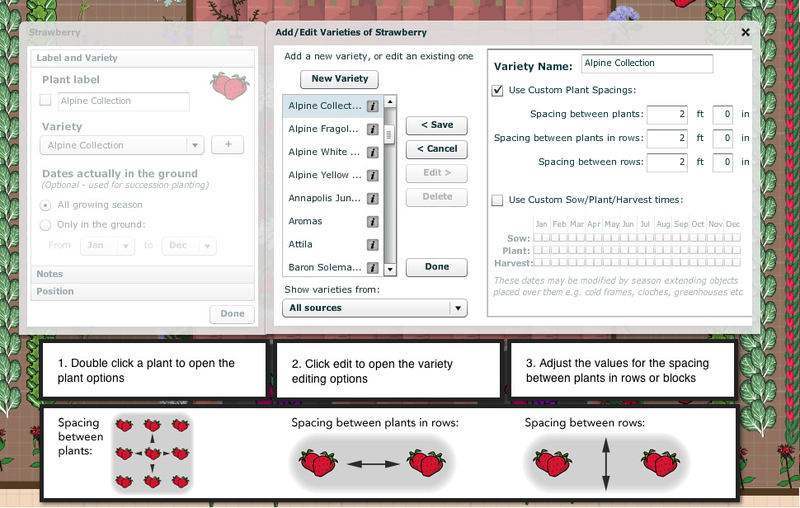 This is demonstrated in the second half of the Adding Plants and Varieties video on Garden Planner's login screen. Can I change the sow/plant/harvest dates the Garden Planner has suggested? Can I change the plant spacings that the Garden Planner has suggested? Click Save, then click Done, and Done. How do I copy my plan for next year's garden? 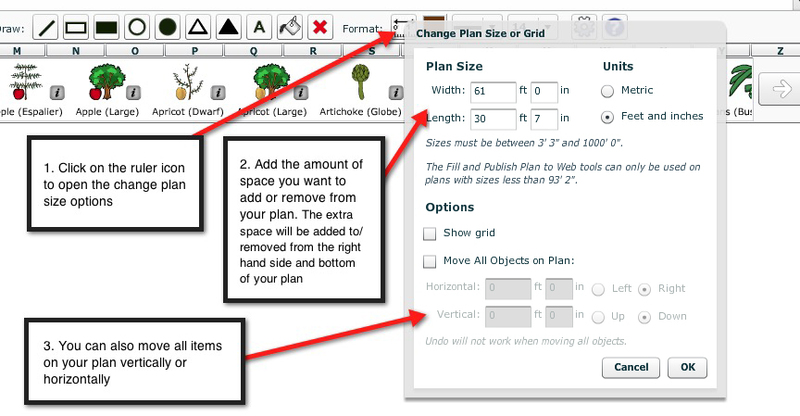 The Garden Planner can copy your garden layout and link the plans for crop rotation. The new plan will have the same name, but a new year listed. Click on OK and your next year's plan will be created, and you will benefit from crop rotation warnings when you add plants to your plan. This is demonstrated in the Next Year's Plan & Crop Rotation video at the bottom left of the Garden Planner start page, and on page 58 of the user guide. Please note that you will need to have a current subscription in order to create a follow-on plan, since the free trial is limited to one plan. How do I make a plan for my fall garden? Click OK and your new plan will be created. Now when you add a plant, a red warning area will show wherever plants from the same crop family were grown previously. If you do not wish to see crop rotation warnings for your fall plan, click on the Settings cog in your fall plan's toolbar, de-select the 'Show crop rotation warnings when adding plants' option, and click OK.
How do I plan succession planting with the Garden Planner? 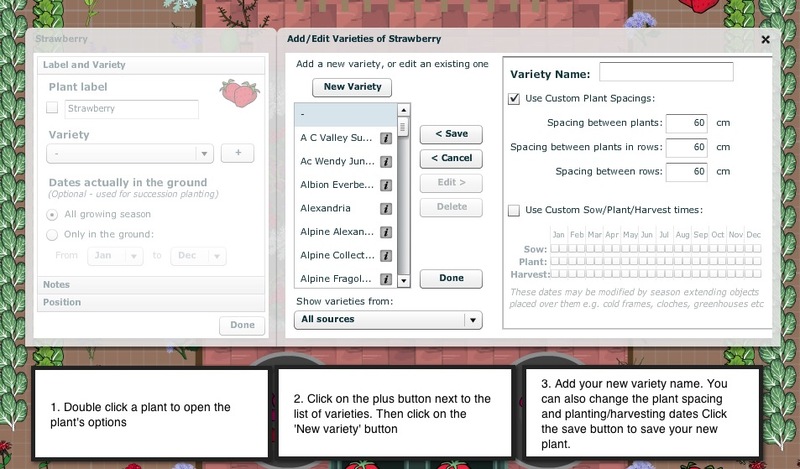 To set up succession planting for a selected plant, double-click on the plant on your plan to pull up its Label and Variety box. Choose the Only in the Ground option under the Dates Actually in the Ground heading. 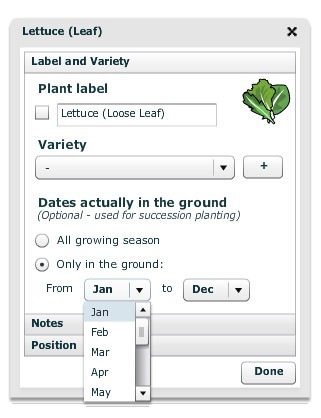 Select the months during which the plant will be grown by selecting from the dropdown lists. Click Done when you are finished. If you enter dates for succession planting that are over winter (for example, September to May for a garden in the Northern Hemisphere), they will be copied across to next year's plan when you use the follow-on plan option. When copied to the new plan, they will be marked as being in the ground from the start of the new year (for example, from January through May). When you set in-ground dates for a plant, your Plant List will show darker lines for the months when your plant is actually growing in the ground. Why are some parts of the planting time lines dimmed? When you set in-ground dates for a plant, your Plant List will show darker lines for the months when your plant is actually growing in the ground. The dimmed parts of the lines indicate the general recommended sowing, planting and harvesting times if they extend beyond the in-ground dates. Why aren't there any planting or harvesting dates for some of my plants? If there are no planting dates for a certain plant, it means that the Garden Planner has calculated that your growing season is not long enough to grow that plant. However you may still be able to grow it successfully using protection such as a greenhouse or cold frame. You can add a season-extending structure over the plants on your plan to see if this helps. 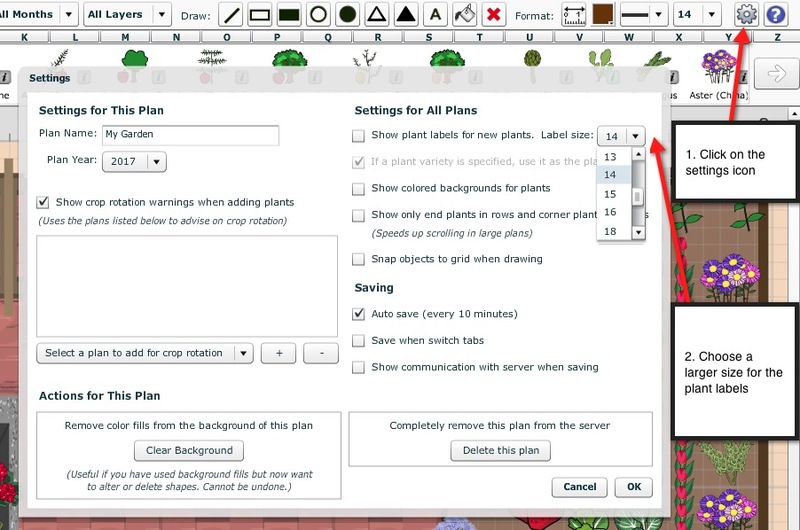 To locate the season extender icons, click on the selection bar drop-down menu just above the plant selection bar (set to All Plants by default) and click on Garden Objects. The plants in the selection bar will then be replaced by garden structures, paving and other non-plant items. Use the right hand arrow to move through these objects to find the season extending structure you need. Add it to your plan, placing it on top of your plants and making sure that all four corner 'handles' of each plant sits within the structure. Your growing season will then be automatically extended for these plants, and they will be listed separately in the Plant List. All dates are recommendations based on weather station data for your area. You should also consult seed packets or local gardening advice to ensure that you are aware of the best times to plant for your local conditions. If you have created a follow-on plan and crop rotations are not showing as you expect, Please contact us with the name and year of the plans concerned. The 'shadow' problem is related to having used the Background Fill tool. The Fill adds color to the background around objects, so if you add a Background Fill, then move a shape or object, you'll see the color of the background before that object was added. In general it's best to use the Background Fill tool very sparingly, and preferably only after everything else is in place. To remove Background Fills, click on the Settings cog in your plan's toolbar and then click on Clear Background under 'Actions for this plan'. We save all plans on our servers, so please contact us with the name of your missing plan and the approximate time and date it was deleted if possible. I'm visually impaired. How can I make it easier to view the Garden Planner? 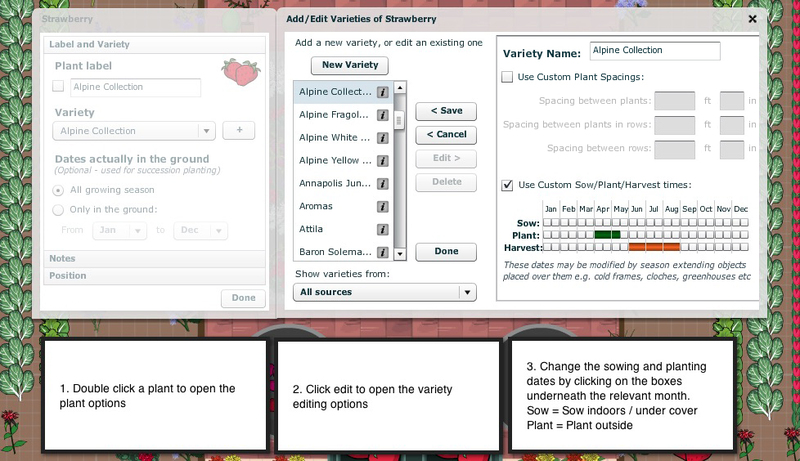 You can also increase the size of plant labels to make them easier to view. You can do this on your plan by clicking on Settings (the cog icon) and, under Settings For All Plans, click on the drop-down box and choose a larger size for the labels. Once your plan is finished you can use the Publish Plan to Web button to publish your plan on a normal webpage which will be zoomable like any other webpage. 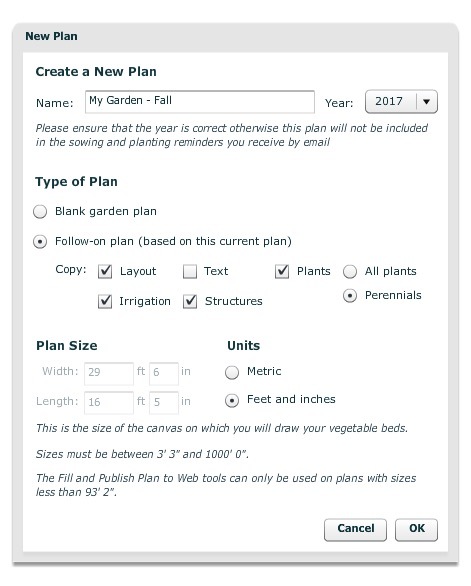 Please see the Printing & Sharing Your Plan video on the Garden Planner start page for a demonstration of how this works. How can I email my plan? There are two ways to email your plan. You can either publish your plan to the web and then share the link to the webpage in an email, or you can save your plan as a PDF file and attach it to an email. Copy and paste the link into your email to share it. PC: you may need to install PDF conversion software such as Cute PDF, which is free from www.cutepdf.com (make sure to de-select the options to change your search engine, homepage and browser). Once installed, you can print your plan to PDF. Click Print Plan, click OK and select the PDF writer as the printer. (If you're using Internet Explorer in Windows 10, also make sure to select the 'Print to file' check box.) When you click OK, you will be prompted to save the PDF to your computer. Mac: Click Print Plan, click OK, click OK again, then click on the drop-down arrow next to PDF and save the file to a location on your computer. You shouldn't experience crashes or 'freezing' with the Garden Planner, so it's likely that this is a problem with Adobe Flash Player on your computer. In particular, Flash Player likes to have plenty of memory (RAM) available. Please restart your computer (this resets Flash and frees up memory) and then login to the Garden Planner again with no other programs running and no other browser windows or tabs open. Safari: Use the keyboard shortcut Command-Option-E (Mac) or Ctrl-Alt-E (PC), then click the Empty button. Then restart your browser and login to the Garden Planner with no other programs running and no other browser windows or tabs open. If your plans are quite large it's likely that Flash Player (which the Garden Planner runs on) is struggling to draw your plans with the amount of memory available on your computer. Please restart your computer - this will reset Flash Player and also help to free up any spare memory on your machine, and should help. Then login to the Garden Planner again with no other programs running and no other browser windows or tabs open, and see if that helps. We would also advise choosing the 'Show only end plants ' option to reduce the amount of memory that Flash needs to draw your plan. To do this, please open your plan and click on the Settings cog in the toolbar, then select 'Show only end plants in rows and corner plants in blocks' and click OK. When a plan is loaded, each type of object (shapes, text, plants, garden objects, notes) is loaded separately, one after the other. If there is some interruption to the connection between your computer and our server, it could result in some parts not loading (you should see that shown as a red cross in the Web Communication box that comes up at the bottom right). If this happens, it's important to just close the Garden Planner straight away without making changes to the plan. Making changes would cause the Garden Planner to then save that incomplete version of the plan. If you close the Garden Planner and then reopen it, you should find that everything loads correctly the next time. We store copies of each save point in your plans on our servers. If your plan has saved with some elements missing, please contact us, including in your email the name and year of the affected plan. Plans don't always show in the Recently Viewed plans list, especially if you have been working on or referring to several plans. Please click on Open Plan on the left hand side of the Garden Planner's start screen and check whether it is on the list of plans. If not, please contact us with the name and year of the missing plan.